In early 1984, the WNYRHS acquired from Amtrak©, former New York Central Railroad coach cars #2906, #2915, #2918, #2932, and #2941. In December of 2006, car #2933 joined the fleet in Medina and was ready for the "Day Out With Thomas©" Trips. 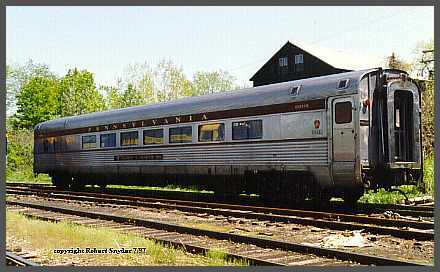 These Stainless Steel, 56 seat cars, part of Amtrak series "5630-5689", were built as New York Central Railroad lot #2171 between October 1946 - March 1947 by the Edward G. Budd Company, series #2900 - 2959. Initially, these cars were assigned to the Central's famous New York - Chicago "Empire State Express"and Later in their careers, saw service on the entire NYC System. On welded rail, these cars run incredibly smooth and are very quiet, a tibute to the quaility of "Budd" built cars! 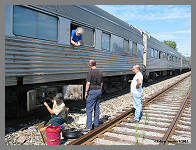 All six of the cars have been extensively renovated and overhauled and are now on lease to The Medina Railroad Museum, in Medina, New York. The Medina Railroad Museum is offering excursions throughout 2018 using our coaches and Falls Road Railroad motive power. 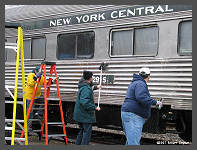 In 2007, the Medina Railroad Museum purchased two vintage New York Central E-8 diesel locomotives (NYC 4068 and NYC 4080), which are being restored and will used to power an all New York Central vintage trainset! 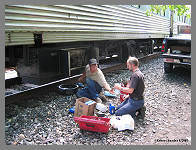 Please visit their site for all the rail excursions that they will be offering this coming season! 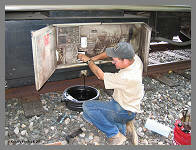 You can see below just some of the work that goes into keeping our coaches in top operating condition. 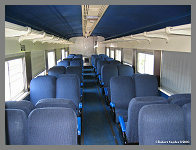 Almost all of the cars have had their interiors restored to as rebuilt by Amtrak© condition with new upholstery and carpeting. Chief car mechanics George S. and Alan O. perform one of the many seasonal tasks of keeping the Air Conditioning - Heating Units in top condition. Routine oil changes after so many hours of operation are a necessity to prevent unpleasant break downs. Power Washing and Scrubing are part of routine maintenance and the shine off the Stainless Steel is well worth the effort. The two year "COT&S" inspection of the "D22" Air Brake System has just been completed which required the "Cleaning" "Oiling" "Testing" and "Stenciling" inspection/certification of each brake valve on all the cars. There is always something to do but the work gets done as "Car Shop Foreman" Rick H. supervises the work. President Eisenhower in his 1952 campaign. from the most famous of trains. #7135 - The "Francis McGrath" a Pennsylvania Railroad, a 29 seat "Parlor Car"
Part of the Pennsy's "Congressional Fleet." Once used by a railroad president for VIP's. Donated to the Society in 2002, by Mr. Brad Black, The NYC System 10-6 Sleeper was known as the "Hocking River." 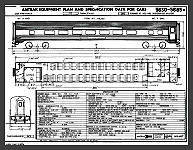 Built by the Pullman Company for the NYC in 1948, the car has 10 roomettes and 6 double bedrooms. It has been kept in excellent condition and will be returned to original NYC colors in the near future. On display and stored at the Medina Railroad Museum in Medina, New York.